I’m ready to start decorating for fall! Prior to 9/11, I used to start the fall decor on September 1, but now I tend to keep my red, white and blue up until after that date each year. Well, it’s the 12th, and I’m ready to move into the fall season. I am in love with this beautiful ombre rosette wreath that my friend Bev at Flamingo Toes created a while back. I love the texture, the pretty fabric, the ombre effect Bev created…. but I super duper love the tiny little “FALL” banner. 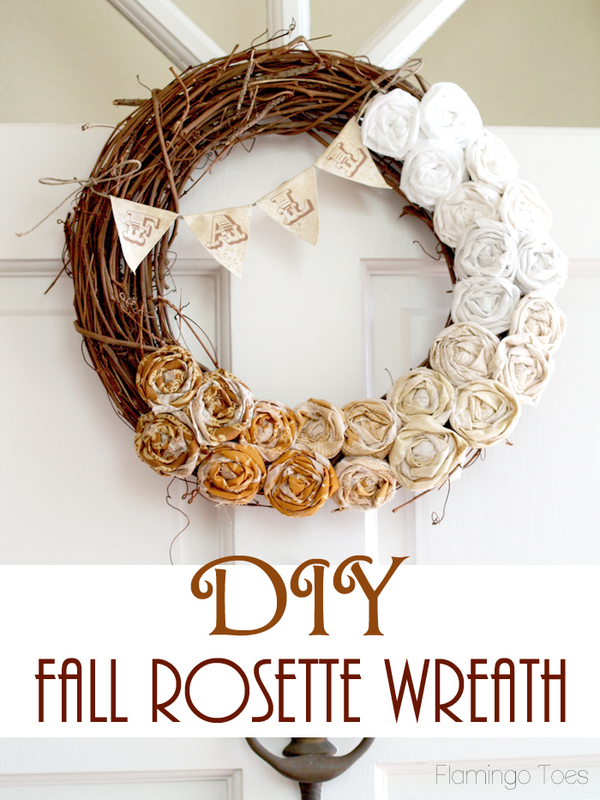 Click HERE for the full tutorial on how to make this wreath. Bev has become a really great “real life” friend and she’s my partner/co-founder of The SoCal Social. If you’re a blogger in the Southern California area, we are giving away a ticket to the event. Click HERE to enter. You can also keep up with Bev on Facebook, Twitter, Instagram, Pinterest and Google Plus. Thanks so much for sharing dear!! You are the best Viv!